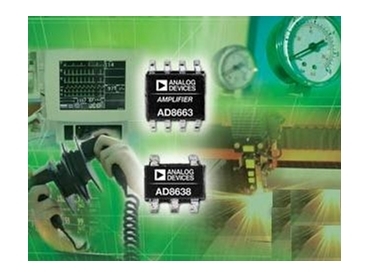 Analog Devices’ new precision operational amplifiers (op amps), AD8663 and the AD8638 deliver a combination of accuracy, power efficiency and versatility with a wide 5-V to 16-V operating range for an assortment of industrial, medical and consumer applications. Manufactured on Analog Devices’ proprietary iCMOS high-voltage industrial process technology, the new precision op amps are available in packages that are 70 % smaller than competing devices, making them ideal for high-density and portable applications where board space is at a premium. The AD8663 is a 16-V precision, low noise, rail-to-rail op amp that addresses the performance, power and cost requirements of portable and battery-operated applications, such as patient monitors, defibrillators, remote industrial controls and optical sensors. These types of higher-voltage portable devices are increasingly adopting lithium-ion, lithium-polymer and other batteries operating at 3-V to 16 V ranges. This shift in battery technologies is creating a growing demand for signal conditioning components capable of supporting high voltages, while also providing good power efficiency, thermal management and precision. The AD8663 meets these requirements by incorporating Analog Devices’ patented DigiTrim in-circuit trimming technology to achieve low offset voltage, 90-dB CMRR (common mode rejection ratio), and 105-dB PSRR (power supply rejection ratio), thus providing 90 % better accuracy than other devices in its class. The new device also features superior performance over varying power supplies and temperatures, with a maximum voltage offset drift of 450 microvolts at 125 degrees C over a wide input range. In addition, the AD8663 consumes only 180 microamps while keeping low-frequency voltage noise at 21 nV/rt-Hz. The combination of high precision, low power consumption, small size and stability over temperature is particularly suited for pressure, temperature and fibre-optic sensors, portable industrial tools and other applications where accuracy must be maintained over fluctuating environmental conditions. The AD8663 works well with Analog Devices’ low-power, low-sample-rate data converters and microcontrollers. The AD8638 is a 16-V zero-drift precision op amp designed for industrial instrumentation, automotive and sensor applications that must accommodate wide variations in temperature, power supply, load and input signal without introducing signal conditioning errors. The new op amp extends the operating voltage and temperature range for both single- and dual-supply applications and is the first to combine the size, power and performance advantages of the iCMOS industrial manufacturing process with Analog Devices’ patented auto-zero and low-drift technologies. The result is a device with 140-dB CMRR and 140 dB PSRR, making it up to 10-dB more accurate than competitive zero-drift op amps. For designers requiring the highest precision temperature-, current- or pressure measurement in systems using thermocouples, strain gauges and position sensors, the AD8638 features a 10-microvolt offset voltage over temperature and a maximum offset drift of 80 nV/ degrees C, alleviating the need for additional circuitry such as temperature correction loops. Featuring a 4 times faster output saturation recovery time than other op amps in its class, the new zero-drift op amp is ideal for applications such as sensors in harsh or ruggedised environments or temperature-sensitive feedback and control circuits that are designed to take frequent, measurements where the outputs are driven into the supply rails. The AD8638 works well with Analog Devices’ low-frequency ADCs (AD7732), multiplying DACs (AD7534, AD667), audio DACs (AD1855), voltage references (ADR02, AD780, REF192, AD766) and bridge sensors. The new series precision operational amplifiers are available from Avnet.